Naaaw, the Orc is sad at the state of affairs at gPotato. It’s only been a week since gPotato answered the storm that the players of Allods Online stirred up on the official forums and blogs across the Internet. Darren Allarde, associate producer for the game at gPotato, even went on Massively Speaking to talk about the controversy. Somehow, it feels like ages ago. And for the players of Allods, it was an eternity ago. Even though nothing was really said about what was going to be done to the cash shop prices, it seemed like the community gained a bit of trust in the developers again. At the same time, we did expect more to be said. Since there was really no more info than “we’re looking at it and discussing our options”, and nothing changing in the cash shop since last week, gPotato would do well to keep talking – no matter how impressive their communication last week was, especially for a F2P game. Over the course of the last week, new problems have been brought up by the community. Reports of speed hacking have started to circulate (which is always tricky in a PvP-game, you have to sift through the real reports and the typical “you ganked me, so you must have used a hack-crap), gold spammers have set up shop in the Zone channels (making it even more useless than it was before). There seem to be no active GMs to battle the ongoing problems either. The silence on the forums is deafening. I’m losing hope in Allods and gPotato. I count the hours before the first reports of bots start to appear, how the gold spammers spread out by using the mail system, how speed hacks become more and more common. And despite the game only having two servers, which should be easy to police more or less around the clock, I doubt that gPotato have what it takes to turn this game into what it could truly be. gPotato, you impressed us all last week. But it’s not enough. Faith in the way you are handling Allods is eroding fast. You need to keep talking, you need to tell us what is happening to the game. You need to communicate more with the Russian devs, give us more information about what is going to happen in the next patch or the patch after that. Where do you want the game to be when you “launch”? You opened your mouth, your current silence seems more like you’re only waiting it out, hoping that the problems will all go away. I am finishing up my feature about Allods tomorrow, hopefully it will be published in both Swedish and English tomorrow or later this week. It feels odd, but it will end on a rather sad note. My faith that Allods will actually live up to its potential is gone, unless gPotato suddenly turns around and start talking to us again. I will leave my mage in Yasker’s Tower, waiting to see what happens from this point on. I do hope to return soon. Time passes quickly in the MMO-sphere and trust is such a fickle thing. Edit: A few minutes after I posted this, gPotato posted on their Allods Twitter about a new announcement. True enough, they have now posted on the official website that they are “making revisions to a majority of the Allods Online item shop” and that these changes will go live sometime during this week. They thank everyone for the feedback and that they’ve “revised pricing so that more people can participate in this feature of the game”. No actual news on what kinds of revisions they are doing, but I guess we will see later this week. Have they learned their lesson? You know me, I’m more of a lover than a hater. I’m all about the constructive criticism, man! And since I’ve been busy playing Allods Online the last couple of days, I thought I’d write down some thoughts about what could make the game really great. It is a good game, the writing and the setting have me transfixed! But it could be better, by just improving a few things. Let’s see, here’s what I’d like to see improved before the game goes from “fake beta” to “launched game”. Fix the chat interface. Right now it’s hideously clumsy, lacking features like player created chat tabs or custom channels. Just a couple of simple tweaks to bring it up to modern MMO standards. Also, please let us block out shouts. I know you have to use megaphones for it, just like in other F2P-games, but that should be the shouter’s problem – not mine. Fix a bunch of annoying quests. One of the most annoying quests I’ve encountered so far was Late For Work!, in which I was supposed to pick up three crates of wine for a guard. The only problem was that only three crates spawned, usually right after an enemy spawned two feet away. It was camping galore. You might want to track quests like those before someone rage quits after their umpteenth crate is stolen by a summoner. Add a quest item tab to the bag, Age of Conan-style. I know you want to sell us bigger bags through the item store, but be nice! Usually a lot of quests point to the same mobs or areas, which is great and all. But the bag has a tendency to fill up really fast, especially when there’s a lot of quest items involved. We got a reagent tab already, a quest item tab would not be too much to ask for would it? It’s 2010, after all! Me and Massively's Krystalle, rocking it up in Nezebgrad. Fix the darn cash shop. Yes, it’s only been a few days since it was unveiled and yes, most of those days have been during the weekend. I am giving you the benefit of the doubt, I am still playing after all! But stop looking like greedy goblins and make us want to give you money. Be our buddies and sell us cool stuff, everything from vanity items to bag space or things that make travel easier. And don’t even consider that mount with a measly 15% speed increase unless I buy extra food from the item shop. Do you want us to love or hate you? Now on to one thing I think should stay exactly the same! Please don’t make leveling faster. It’s good where it is. Fatigue is a pretty odd mechanic, but I haven’t had any trouble with it so far. Don’t bump experience for mob kills, let them stay as low as they are, and don’t increase quest experience either. If all the people complaining about the game being slow leave, Allods will be so much better off. Or I will, at least. I really like Allods, I do. I think it’s fun, despite the obvious lazy quest for experience grind. But the writing is so good, I can’t believe that the poor devs who obviously put a lot of work into the writing and the world design might get screwed over by the idiots in economics or marketing. If the conspiracy theories mentioned by Keen are correct, I hope the contract between gPotato and Astrum Nival crumbles and someone like Frogster picks up the game. The Runes of Magic cash shop is far from perfect, but it at least makes sense. Also, look at the steady stream of updates that are released for RoM. I think Froster/Runewaker are doing a pretty good job there. No matter what happens, the future is sure to be interesting for Allods. Will it bomb? Will it soar on the wings of F2P success? Will I ever reach level 10 so I can wear those gloves that dropped off some random mob? Who knows? But how about you? Anything about Allods you want to fix, or do you just wish that we’d stop talking about it already? Allods Online has gone into open beta, with the promise that no characters created during this beta will be deleted once it’s over (similar to how Runes of Magic did it). That more or less means that the game has launched, but still giving the devs the freedom to make huge changes to the game with the excuse that “it’s only beta”. But seriously, the game could have launched now. It feels polished enough and the servers have made an amazing job at staying pretty stable under the onslaught of players that tried to get in to the game from day one. Sure, they’ve crashed at times, but all things considered Allods Online could just as well has been released. And considering that the cash shop, which is how gPotato is supposed to make money off this game, has opened…well, if money is involved, I guess the game has (actually) launched. What attracts me to Allods Online, despite it being a pretty standard Diku-MMO filled with ten kill rats-quests all over the place, is primarily the art. While it might look like a WoW-clone at first glance, the character and environmental design in Allods is one of the best I’ve seen in a long time. The graphics are not advanced though and it’s bound to run on most computers. Fraps keeps ticking up way past 100 FPS on my machine, which feels pretty odd. Loading screens are fast. There has already been a lot said about gPotato’s pricing in Allods Online’s item shop, on both side of the argument. I will leave that for now, but there is a discussion about it in this (now rather long) Buzz about Allods. Instead, I’ll just state that I am a bit worried about how the game is actually being run. Despite the obvious anger on the forums over the move, I have yet to see a dev or community rep try to calm people down somehow. I was also struck by the complete absence of any help function or report button in the actual game today, as a discussion about marijuana raged in Zone chat. I didn’t mind what was said, same old back and forth between pro and anti camps that will never get anywhere in a chat channel in a MMO, but I felt that it had no real place there. Seeing no GM step in, I looked for a way to contact them – if not now, then for future reference. I found nothing. Am I blind, or is there no way to turn to the GMs when needed? I guess that scares me more than any price that gPotato will put on things in their cash store. How will Allods be run? Will there be active GMs? Will we have direct avenues to contact them if need be? Or will Allods turn into the kind of bizarre cesspool of a MMO that we all dread, with constant flaming in chat channels and an increasingly annoying bot problem (haven’t seen any yet, so don’t panic)? Did I mention that the starter zones is a bit crowded? I don’t know. Right now I just try to ignore it, dreaming of the days when we are able to create our own chat tabs and custom channels. I am having fun just exploring the pretty and strange world that is Allods Online, but just because a game is “free to play” I don’t expect any less from the developers here compared to a subscription based game. Monetize any way you like, but I will hold you to the same standard as any other MMO. I believe that’s important, both for my sanity as a player and for the market in general. I have high hopes for Allods Online. It can turn into a really good MMO, with a proper place in the tough MMO market, if the developers take care of their bizarre and Gibberling infested baby. Death to the League! Update with question: I keep seeing references to a rune that is supposed to cost anything from $600 to $6000 in the item shop. Where does that comes from? I can’t find anything of the sort in the actual game. Can someone point to a source? I'm not here, look away. Please? Time for another one of those multi-subject posts, I believe. I’ve been quite busy working over the last few weeks, which has felt great – I haven’t had this much to do, every day, for a long time. It also means I can feel a bit more secure financially, at least until this contract is finished (which might or might not be extended). But enough of that, to the games! EVE Online – I took the leap, accepted the invitation to a null-sec alliance and moved into 0.0, straight into a war zone. It feels good, though, since the alliance I am in covers a pretty good area, which gives me room to rat and explore in order to get my ISKies up. I’m really poor, that’s for sure. I should be ready for some actual fighting in the near future. I never thought I’d end up in this situation, but now I am. Hopefully, when I finally leave EVE, I will have some good 0.0 stories to tell. Heavy Rain – I got my promo copy of Heavy Rain last week and me and the girlfriend have spent about five hours with it over the weekend. I won’t spoil anything, don’t worry. It’s a magnificent game so far, completely different from anything you’ve ever played before (except Fahrenheit/Indigo Prophecy). Sadly, David Cage either can’t control himself or someone is forcing him to add all kinds of stuff to the game that has no place there. You will see what I mean when you play it, but some details do deter from what is one of the most subtle and beautiful games in a long time. I’m a bit worried about how it will turn out as we progress, as Fahrenheit went completely nuts after a few hours and spiraled out of control. Two things you do a lot in Heavy Rain: open fridges and visit the toilet. You never, ever wash your hands though. Dirty video game people! Bioshock 2 – I got the special edition of Bioshock 2 sitting next to me in the sofa, mostly because I still haven’t figured out what to do with it. That thing is huge. The game is…well, it’s not the first one. I’m not 100% certain that I really like it. Multiplayer is a lot of fun though, playing as a splicer fighting other splicers in the ruins of Rapture is hilarious. Trying to grab a Little Sister from the other team while my character is cackling like a madman makes me giggle every time. I just wish they would patch it up and make it a bit smoother to use, right now it’s quite cumbersome and getting into a game is not as easy as it should be on Xbox Live. Playing Bioshock 2 also reminded me of one of the things I hated with the first game – the story is always told behind solid glass. You are always on the outside, looking in. I never feel like a part of the process, I never get to meet the characters face to face. Now, there was a twist in the first game that made me forgive this tendency a bit, but can they really pull that off again? I truly doubt it. This picture is, in a way, Heavy Rain related. Get back to me when you understand the (bad) joke. Allods Online – Allods Online is entering open beta tomorrow and the characters created won’t be deleted when the game is launched. Which, for most people (including me), means that the game is actually launching tomorrow. Great! It will be fun to see how things will turn out for Allods, and I do plan to play it myself. I just can’t decide on a Gibberling or Risen? Oh, the pain. Star Trek Online – I am still trying to find the time to play this to a greater extent, but the servers are still quite unstable. Isn’t that grace period up? Shouldn’t we expect them to be at least fairly stable by now? I’m annoyed, but I mostly got myself to blame. I am going to give it a proper go this week, but I must admit that I’m not particularly enjoying it. It’s not nearly polished enough to be a subscription game, and I wouldn’t put the triple-A stamp on it (whatever that really means, discuss). We're gonna eat your face. Can your art-department create characters that look this awesome while still being very much inspired by the boys and girls at Blizzard? If not, sack them and find new ones. Or just skip the whole inspiration-part and do something else. Oh, I don’t know, something a bit more innovative than carbon-copying the art style of the biggest MMO on the block (which you will fervently deny while dodging the whole point). 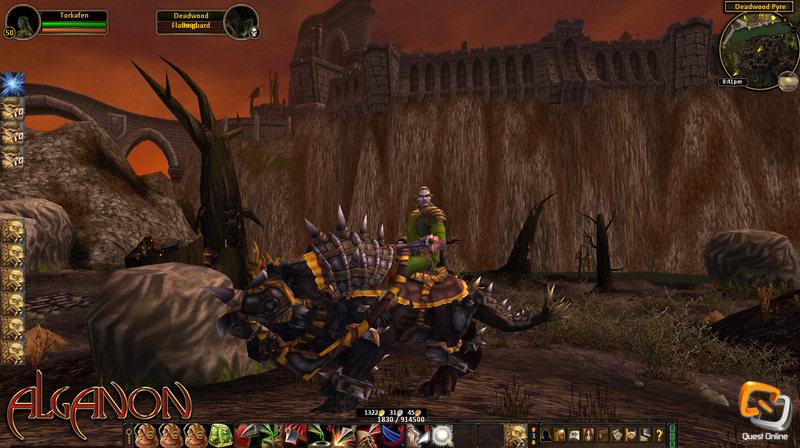 The above screenshot comes from Allods Online. Allods Online looks a lot like World of Warcraft, but somehow the art-guys at Astrum Nival managed to make their game look really, really good. Some of the concept art is truly fantastic and AO is a pleasure to look at. It’s in closed beta, but a few places might have keys left for it. Note that I didn’t say anything about gameplay. AO still has to prove its worth in that department. Update: While I was finishing up this post, Sera’s latest Anti-Aliased column was published at Massively, also touching on a similar subject. Go read!